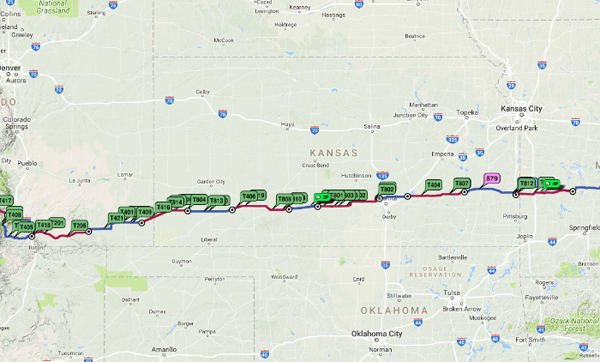 Yesterday was day 4 of the Race Across America and the Cycling for Cameron Team last night passed the half way mark at 9pm local time in Kansas. 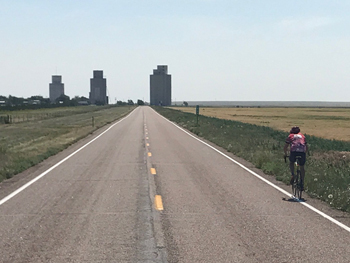 After brutal heat waves in California and Arizona, gruelling climbs and cool temperatures in Colorado, high winds and a threatening storm in Kansas, the team took a few moments to celebrate this huge achievement of having cycled 1,535 miles! 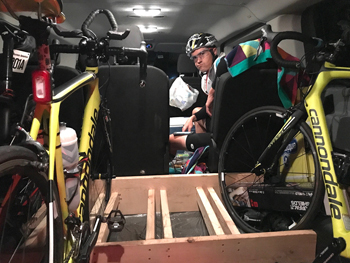 All this is just part of the RAAM experience. 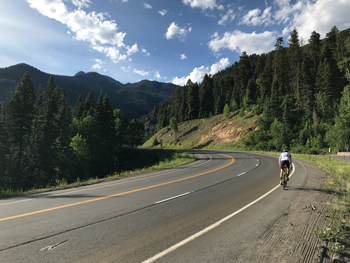 After leaving Oceanside California, the race moved straight into the San Juan mountains. As the cool ocean breeze faded, the heat went up. Beautiful green scenery together with amazing smells and colours from various plants such as lavender, citrus trees, fuchsias, poppies and orchids. From the top of San Juan mountains, there was a 4,000 feet vertical drop called the ‘glass elevator’ down to the desert floor (below sea level). 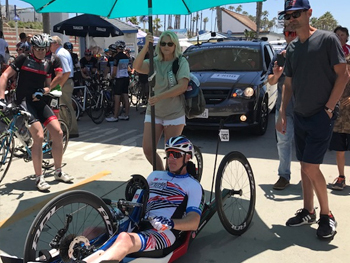 Stuart Baldwin did us proud and cycled down at a speed of 80km per hour! And with the desert, the heat! Temperatures reaching up to a scorching 115 degrees. 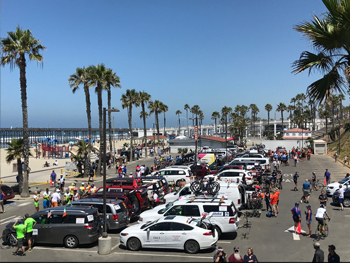 The riders were taking advantage of the relay-style race conditions and were trading off very 10-15 minutes to have ice ‘baths’. 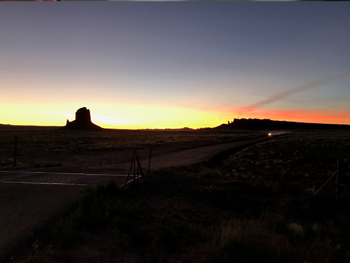 More desert as they continue in Arizona and now the temperatures have soared to 117 degrees. And then up they climbed up to a high desert plateau at 7,000 feet where the scenery changed again to forests and lush greenery. 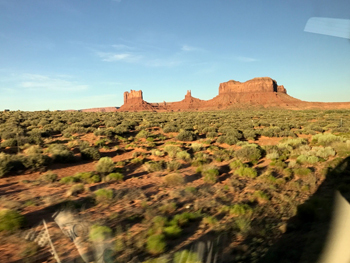 But soon they dropped back down 4,000 feet into the desert and cycled through the iconic Monument Valley, a red-sand region on the Arizona/Utah border (a frequently used area for many Western movies). 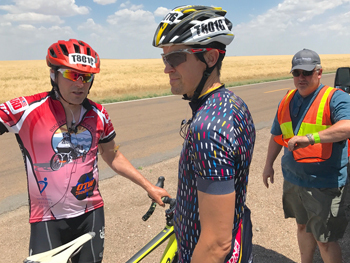 The route took them through the southeast corner of Utah. Very similar hot conditions as in Arizona and they even saw some wild mustangs along the side of the road. 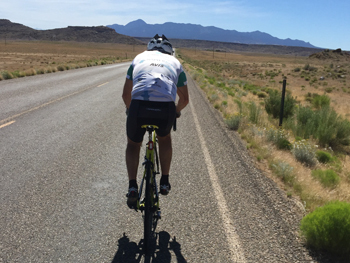 Beautiful open roads but still extremely hot. 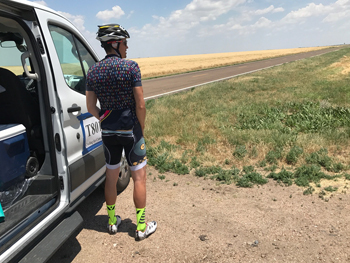 They had Colorado firmly in their sight for some cooler conditions! 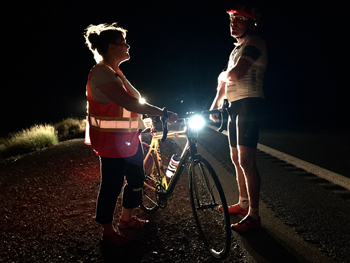 In Utah they broke the 850 mile mark. 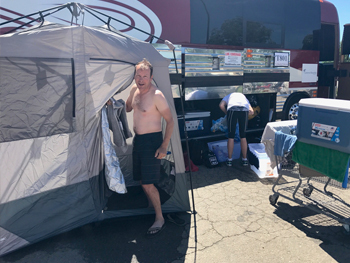 Marc enjoys a well served shower by the bus! Desert quickly turned to green, lush vegetation. Along with this, some hills for them to climb! 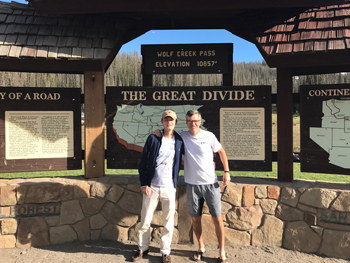 They crossed the Rockies via Durango and Mark, Marc, Fred and Chris had the steep climb up Wolf Creek Pass (11,000 feet). 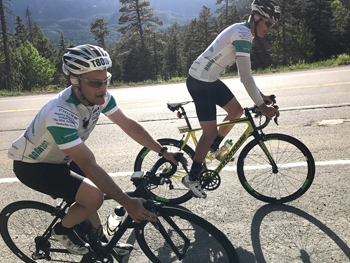 The other team then climbed some other passes during the night, with an average of 9,000 feet per hill. Never below 7,000 feet, so the air much fresher and quite thin, with nighttime lows of around 40 degrees. Extremely cold after the hot desert rides! 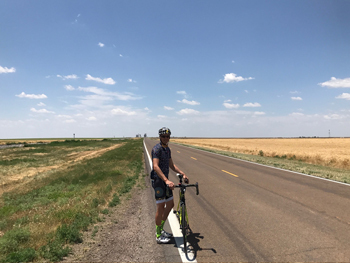 Last part of Colorado via Pritchett with approximately 100 miles of gentle decline with favourable tail winds towards Kansas. Wow! The Wizard of Oz comes to mind! 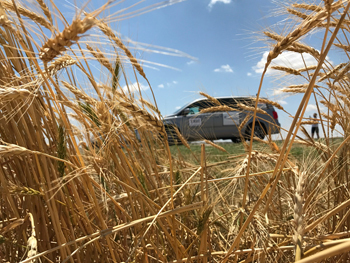 Flat, windy and lots of wheat. 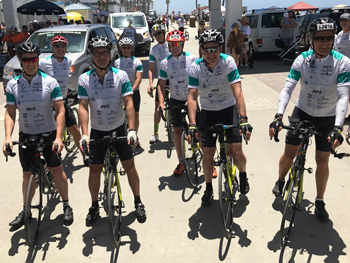 Hard cycling against the wind (average 25mph) and Kevin, Andy, Stuart and Nicky just started a 225 mile shift, which will take them about 130 m short of the border. 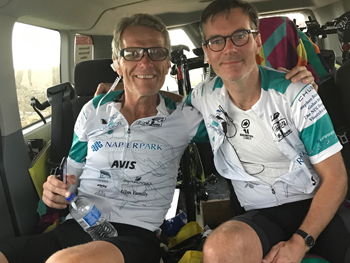 As of 9 pm local time on 20th June, they have passed the half way mark of 1,535 miles! Lots of cheers and celebrations going on! 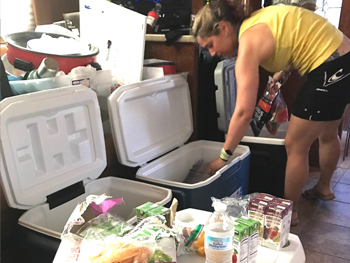 They are cracking open a protein smoothie to keep them going for the next 1,535 miles. Celebrating reaching the halfway point!! 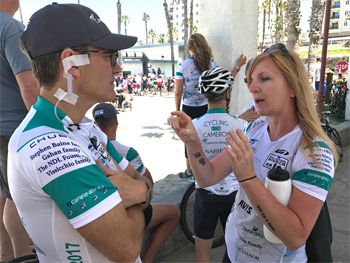 Please keep supporting these racers with their hard-working, enthusiastic and energetic crew! Thank you so much to John Rennison for being our crew photographer and capturing such wonderful images. They are on target to reach Annapolis on Saturday so please keep cheering them on. On Instagram: Please follow our page and comment here too!